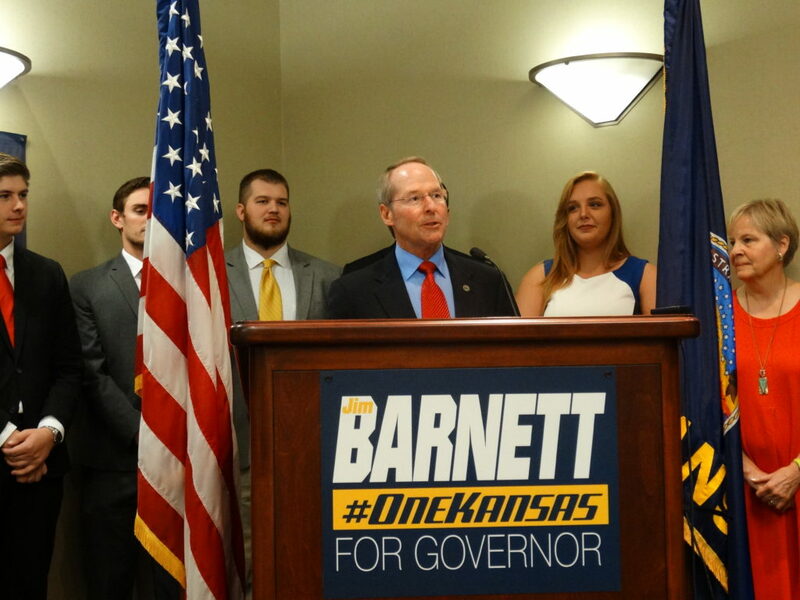 Former state Sen. Jim Barnett added some heat to the race for the Republican nomination for governor this week by taking direct aim at the presumed front-runner, Secretary of State Kris Kobach. 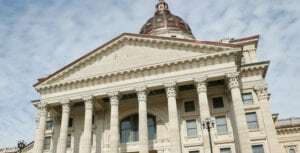 In a news release, Barnett, a physician who now lives in Topeka but used to represent a Senate district in Emporia, laid out a list of priorities that he wants Kansas lawmakers to focus on in the upcoming legislative session, which begins Monday. Most of the items were part of his standard stump speeches about education, health care and economic development. But then he added an extra item that was clearly aimed at Kobach. Kobach’s campaign did not immediately respond to email and telephone messages requesting comment. The Crosscheck program is something that actually began under Kobach’s predecessor, former Secretary of State Ron Thornburgh, also a Republican. It’s a computer database that is intended to identify people who are registered to vote in multiple states, something that is not uncommon when people move across a state line and register in their new home without canceling their old voter registration. Initially it involved only the states of Kansas, Missouri, Iowa and Nebraska, but it has since been expanded to include 25 states. It has gained national attention — and national criticism — in recent months after Kobach highlighted it during the first meeting of President Donald Trump’s Advisory Commission on Election Integrity, where Kobach serves as vice chairman. That group is asking all 50 states to submit their voter registration rolls into the system, rolls that contain a lot of personal information, including in many cases the last four digits of Social Security numbers. An investigation by the nonprofit news organization ProPublica that was published in October revealed that the Crosscheck system is fraught with security issues. “Crosscheck’s files are hosted on an insecure server, according to its own information. Usernames and passwords were regularly shared by email, making them vulnerable to snooping. And passwords were overly simplistic and only irregularly changed,” ProPublica reported. Kobach’s office has said it is reviewing Crosscheck’s security protocols, but it is not known whether any of the other participating states besides Kansas will share in the cost of any security upgrades. The other issue Barnett raised is one of Kobach’s signature legislative achievements: a law that gives his office the power to prosecute election crimes. Kobach has gained a national profile as a crusader against illegal immigration and voter fraud. 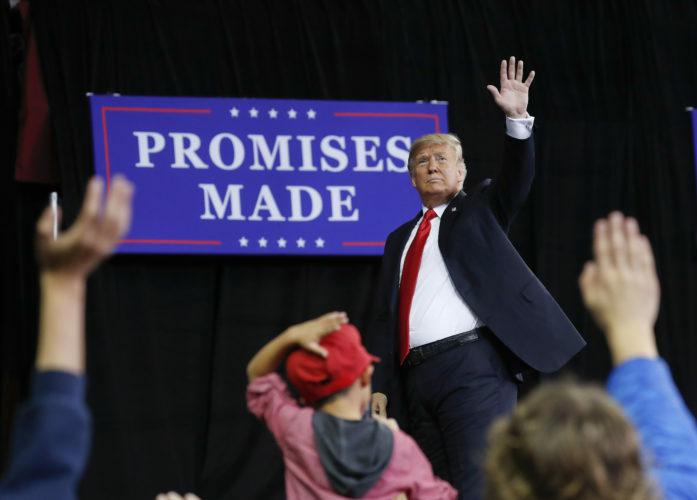 Following the 2016 election, he backed up President Trump’s unsubstantiated claim that “millions” of illegal immigrants voted in that year’s presidential election, a claim Trump has used to refute the argument that Democrat Hillary Clinton actually won the popular vote in 2016 by more than 3 million ballots. Since the 2015 passage of the bill giving him prosecutorial powers, Kobach’s office has filed fewer than a dozen charges, mainly against voters who cast ballots in multiple states. Only one case has involved a person who was not a U.S. citizen at the time he voted but who later became a naturalized citizen. There is reason to believe Kobach didn’t respond to Barnett because he simply doesn’t have to. 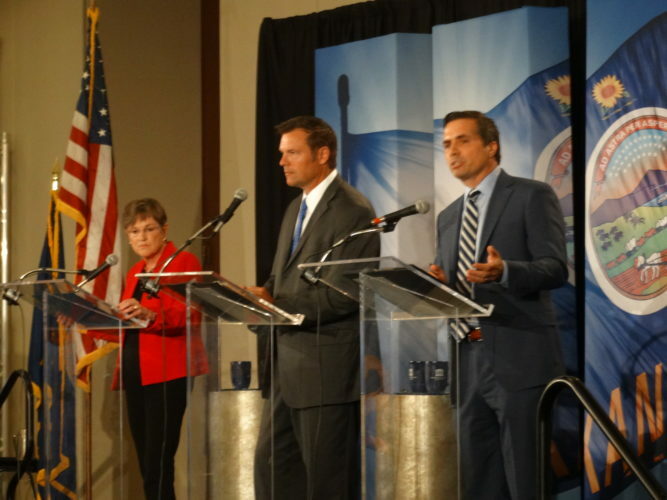 According to one Republican official, a handful of internal polls conducted by some of the campaigns have consistently shown Kobach in the lead, with Lt. Gov. Jeff Colyer a distant second and all the other GOP candidates polling below the margin of error. 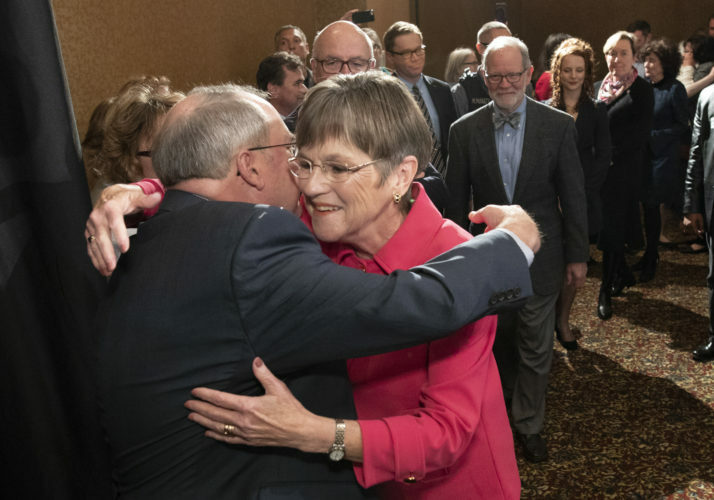 That, however, could be based largely on name recognition, since many voters in Kansas don’t get engaged in the campaigns until after the filing deadline, which is June 1 this year. Meanwhile, Kobach has continued to conduct much of his campaign through national news. 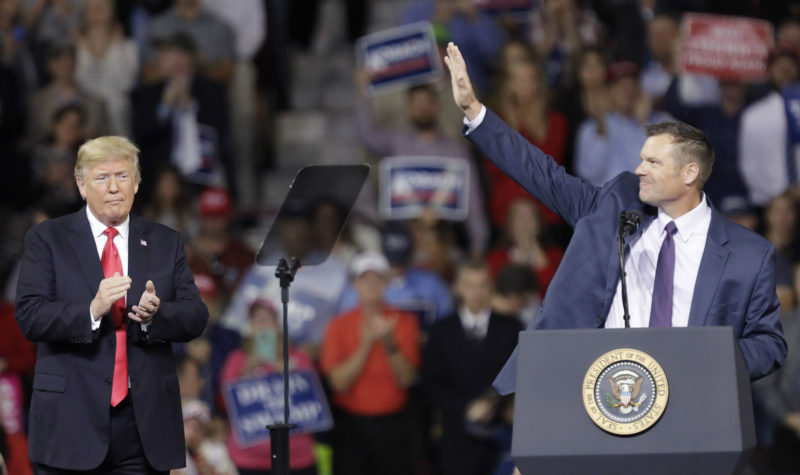 As recently as Tuesday night, he appeared on Fox News, where he denounced a policy of former President Barack Obama known as DACA — Deferred Action for Childhood Arrivals — which allowed certain undocumented immigrants who were brought to the United States as children to remain in the country as long as they met certain conditions. Kobach also is a regular contributor to Breitbart News, a conservative news outlet that was founded by former Trump adviser Steve Bannon. The Trump administration announced in September that it was phasing out that program, putting Congress under pressure to enact legislation similar to DACA. That’s expected to be a major issue in the second half of the 115th Congress, which began Wednesday. There are currently seven major candidates in the GOP race for governor. Besides Kobach, Colyer and Barnett, they include Insurance Commissioner Ken Selzer, Wichita businessman Willis “Wink” Hartman, former Rep. Mark Hutton, of Wichita, and former Rep. Ed O’Malley, who now lives in Wichita but formerly represented a House district in Johnson County.